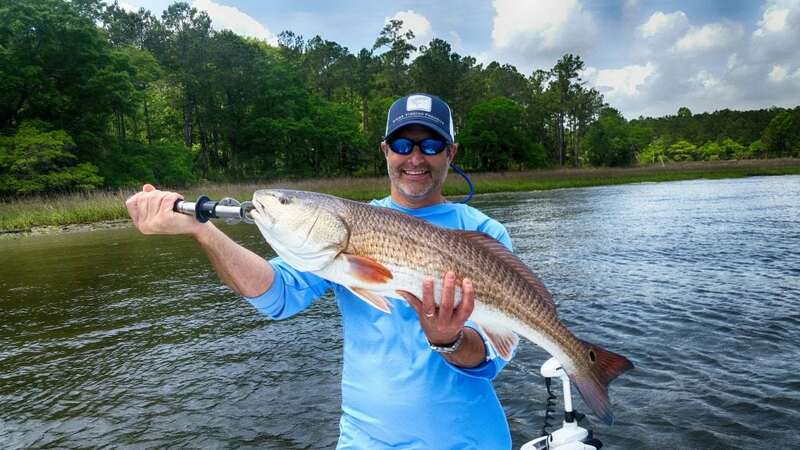 Inshore fishing the estuaries and creeks in Charleston, SC makes for exciting trips. However, there is some impressive nearshore fishing that provides an exciting experience for the serious fisherman. The fish are larger, the species more diverse, and the trips are longer. If you are looking for a truly unique experience, this style of fishing could be your next adventure. Only a couple hours on a boat will yield some impressive water to fish in. There are ample reefs and shipwrecks scattered throughout the Charleston, SC shoreline that makes for incredible fishing. While still within sight of shore, the deeper waters draw in larger fish that rely on the Gulf Stream. You can think of the ocean floor as a desert. For miles upon miles, it’s featureless, lacking hiding places for baitfish to congregate. Finding isolated wrecks and reefs provides a hotspot of fishing activity. Harder to reach, and in deeper water, these spots receive less fishing pressure than those closer to shore. Fishing deep structures allow the boat to be nearly on top of the fish. Sometimes the water is close to 90 feet deep, that’s a lot of room for a fish to fight. There are ample fishing locations, with some being 20 miles out. This is not your average fishing trip. What Kind of Fish Are Caught on Reefs and Wrecks? All kinds. This is what makes the style of fishing so appealing, you just never know what will be on the end of your line. South Carolina is blessed to be a crossroad for large, migratory fish. The species that call the deeper waters home are world famous. Fast and fun to catch, this species is targeted with lighter artificial lures. The friendlier tackle setup is perfect for an impressive amount of hook-ups. Well known as structure seeking fish, Cobia are commonly found on deep water structure. They get big. The average size is around 48 inches, but large fish can weigh in at over 100lbs. More than one species call the deeper waters of South Carolina home. Bull Sharks, Tiger Sharks, even Bonnethead Sharks are found here. When the reef is biting, it’s not uncommon to hook into a monster fish. Smaller than other species of fish, targeting these guys with light tackle is always fun. They school up and are found in abundance if the conditions are right. A term for Redfish that have reached maturity. They are longer than 27inches and put up an extraordinary fight. The biggest Redfish are found in the deeper waters around reefs and wrecks. If you didn’t know, we have Tarpon. Large, these sportfish commonly weigh in at over 100 pounds. When they migrate through, lucky anglers are in for a fish of a lifetime. Big fish are found in big water. The difficulties and dangers surrounding reef fishing make using a charter the best options. At RedFin Charters, our captains know where hidden reefs and wrecks exist and they put you where the action is. Learn more about our Nearshore Fishing Charters.